Memphis Depay was close to becoming an afterthought back in 2016. After succumbing to the cursed Manchester United #7 mantle, the presumed future superstar almost saw the end of the road. However, the embarrassing exit from Manchester lit a fire which Louis Van Gaal and Jose Mourinho failed to spark. Olympique Lyonnais acted as a sanctuary to heal his wounds and regain his pride as a top footballer. Coming into a team which encourages players to display their most skilful capability, his wings bloomed. The shackles which tied him down at United had been pulled off, helping the Dutch winger hit his goal-scoring stride once again. What started as a promising beginning quickly soared into complete dominance. He scored five while assisting seven goals in his first six months in France. Something he couldn’t do in two years at United, he managed to do in less than half a Ligue 1 season. This excellent start boosted him to excel in his first full season, where he scored nineteen goals and assisted thirteen in Ligue 1. Suddenly, he competed with the Mbappe’s and Neymar’s again. However, his rise needs to be indebted to those around him. Nabil Fekir, Tanguy N’Dombele, Moussa Dembele are some to have helped bring back the old Memphis. Bruno Genesio did something prominent managers couldn’t allowing the skilfull Dutchman freedom to threaten through the left while encouraging him to get into goal-scoring positions. Despite all his brilliance for Lyon, it’s the sparkling work in international level which has garnered attention. 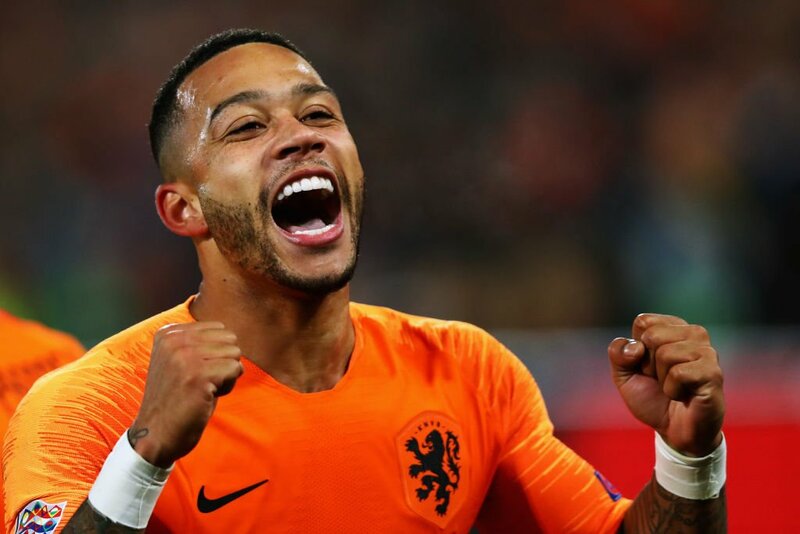 Depay’s triggered a Dutch revival under Ronaldo Koeman, scoring eight goals, assisting five under his regime. On his United debut, he failed big time in a central attacking role. He’s now thriving down the middle, leading the line for a new-look Dutch side. The fact he’s played part in their last six goals itself proves his influence in marshalling Koeman’s attack. He’s now combining his strengths to cause maximum danger for the opponents. Not only does the Dutchman try to wow fans with his skills with the ball, yet his crossing ability, dribbling ability have all improved with strides. Depay no longer needs to rely on set-pieces only. He’s developed a taste for being more lethal in around the box to score goals more consistently. While the peculiar, “silent” celebration against Germany displayed his polarizing attitude, he can actually use it to his advantage. By retaining his confident self-belief, he can keep doubters silent while raising his own stock. Self-belief goes a long way into improving a footballer’s performance-level. Just ask Cristiano Ronaldo. So it’s no surprise with fame, big clubs have once again come calling for the Dutch superstar. This time, things are really serious. His former employers, Manchester United, would want “DepayBack” to be their next “Pogback”, a term used when Pogba returned home. The Red Devils realised their untimely mistake. Having a buy-back clause gives them shotgun rights on the winger. However, after the Old Trafford nightmare, returning to United wouldn’t be on his agenda. Especially when multiple sharks circle around him. Liverpool are surprising contenders after being impressed with his recent heroics. As rumours of Sadio Mane’s departure intensify, Memphis possesses the goal-scoring hunger, trickery to fill his void. He could also coexist Liverpool’s current setup, with his ability playing down the middle making him capable of producing fireworks alongside Mane and Salah. Chelsea were also on his radar, but their transfer ban pours cold water on those plans. Bayern Munich, who wanted him in 2015, would also be attracted to replace the ageing Franck Ribery with a man of Depay’s talents. He could light the Bundesliga on fire with his swagger while keeping the goals pouring for the Bavarians. Memphis earned a rotten reputation among Lyon faithful after being vocal on moving on from the club next summer. Even president Jean-Michael Aulas’ indicated he will be sold for the right price. The Dutch wizard’s ambition is telling. When you are hitting your peak, you’d want to enjoy success at the very top. After overcoming the treacherous road set up by his failures, Memphis is now finally ready to thrive under the spotlight.